Keyser: The Edge was using Keyser capos at the beginning of the Elevation tour but later switched to the more stationary Shubb capo. This might be due to Bono's striking at his LP Goldtop during the 'duel' feature in "Until The End of the World". With the spriing loaded Keyser, it can easily be pushed out of tune. 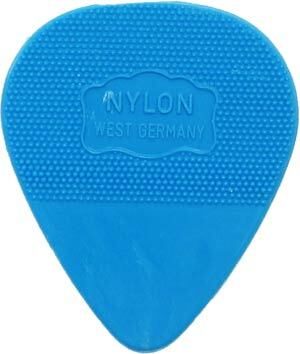 HERDIM blue tear drop picks. Dunlop slides. I've seen Edge use both chrome and brass over the years. I've not read or heard of any particular preference. Dallas Schoo has developed the 'ring slide' that The Edge has been seen using for "Sometimes You Can't Make It On Your Own" and "Miracle Drug" during the Vertigo tour. Desecribed before the tour as his 'secret weapon', said one fan, it is merely as the name suggests - a slide the size of a ring. This allowing for one to play chords and single note figures and slide without putting on/taking off a full size slide. Naturally, this works great for a standard tuned guitar when the desire notes are not that of an open tuned guitar but that of one or two strings only. The Edge has experimented some with strings over the years. In the 1980's and early 1990's, he seemed to favour ROTOSOUND nickel composite strings. 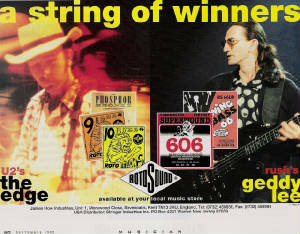 I've seen at least 2 separate adverts for Rotosound strings featuring The Edge in magazines between 1984 & 1992. It seems that most sets were .11's but there may have been some experimentation with sizes along the way. That said, the March 2002 Guitar Player article entitled: "Set-Ups of the Stars: The Edge" [by: Gary Brawer // page #25], states - "Schoo strings up the guitar with ERNIE BALL's (gauged .010-.046), and winds about two and a half turns of string around each of the post. He uses a mixture of hobby wheel lube and graphite to keep the strings from sticking to the bone nut." 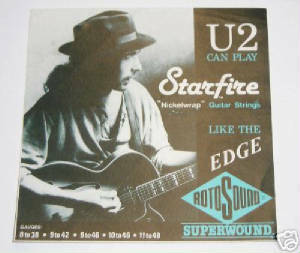 I have heard some other U2/The Edge fans insist that The Edge is using DR strings.